Yukon Albers is the default projection for most Yukon Government data and projects. Here are 3 methods to get your data into that projection. InteractiveOne-at-a-time: Set data frame to desired projection, then export a layer to the data frame coordinate system. Interactive Bulk: Create a template Feature Dataset with the desired target coordinate system, then import to that template. Geoprocessing: Use the Project tool (in Data Management tool box). Set data frame to desired projection, then export a layer to the data frame coordinate system. 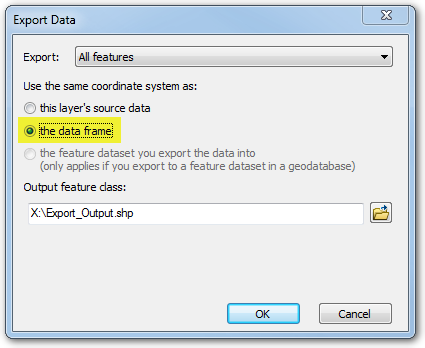 Create a template Feature Dataset with the desired target coordinate system. Anything imported into that template will be reprojected to match. CGVD2013 (height) – optional, can be skipped. Use the Project tool (in Data Management tool box). “NAD83 Yukon Albers” or “NAD83(CSRS) Yukon Albers” ? The CSRS (Canadian Spatial Reference System) variant is newer and more accurate, but that greater accuracy doesn’t mean anything until you get to fine scales, e.g. surveying. For mapping at 1:50,000 and coarser, the differences are slight to non-existent.